A little over 2 weeks ago, i wrote this post about how excited we were to be starting our Bob journey. 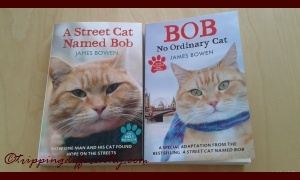 And as promised, here’s the book review of both A Street Cat Named Bob and Bob: No Ordinary Cat. S: What do you think of the book? T: It’s good. It’s funny. I like Bob. S: Why do you like Bob? T: Cos he’s intelligent and cute. S: Which is your favourite part? T: I liked the part where Bob copied James on the toilet. S: Which is the saddest part? T: When James lost Bob. S: Would you like to meet Bob and James? S: Would you tell other kids to read this book? That must be the world’s shortest book review interview ever. But he truly did love the book very much and talked about it for days. Of course, he also liked the fact that he finished his book before mummy finished hers (he finished in 3 days actually). In my defense, even though his book had a few more pages than mine, his had pages with pictures of Bob (such cute pictures) and the font size was bigger. Now for my review of A Street Cat Named Bob. It is an honest book – i love that it reads like James is sitting right there telling you his story. There are no embellishments, just simply his story; a journey from drug addict to a recovering addict to being clean, all along Bob was there, bearing witness, keeping him on track, giving him a reason to be responsible and shape up. Make no mistake, Bob needed James as much as James needed Bob. A street cat, however smart, can always do with a warm home and a good human to feed him and care for him. And Bob knew how to pick his human. This is a story which i found amazing and heartwarming, and i highly recommend it for feel-good summer read. i can’t wait to read the next one; The World According to Bob. Next PostNext Writing On Holiday?? ?